The weather has been really miserably gross. Yesterday, the humidity (and probably the sun) made the heat index go as high as 39C (102F)...gah! Have you ever taken "hot yoga"? I've not, but can imagine it feels just like the day we had yesterday. Still, I walked to the market to pick up some groceries...we still gotta eat, right?! 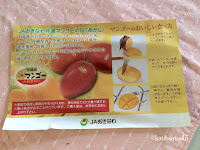 Have you had Japanese peaches?! They are the white variety and when they are perfectly ripe, you can peel the skins off the fruit without a knife. The flesh itself is juicy and sweet. So good chilled...I think this is the first summer Satoshi and I have eaten so many peaches. Sometimes for breakfast Satoshi and I share a peach and stand near the kitchen sink eating it because of all the drippy juices. Anyway, back to the daifuku. This is a piece of peach surrounded by some sweet white bean paste and a very soft mochi. 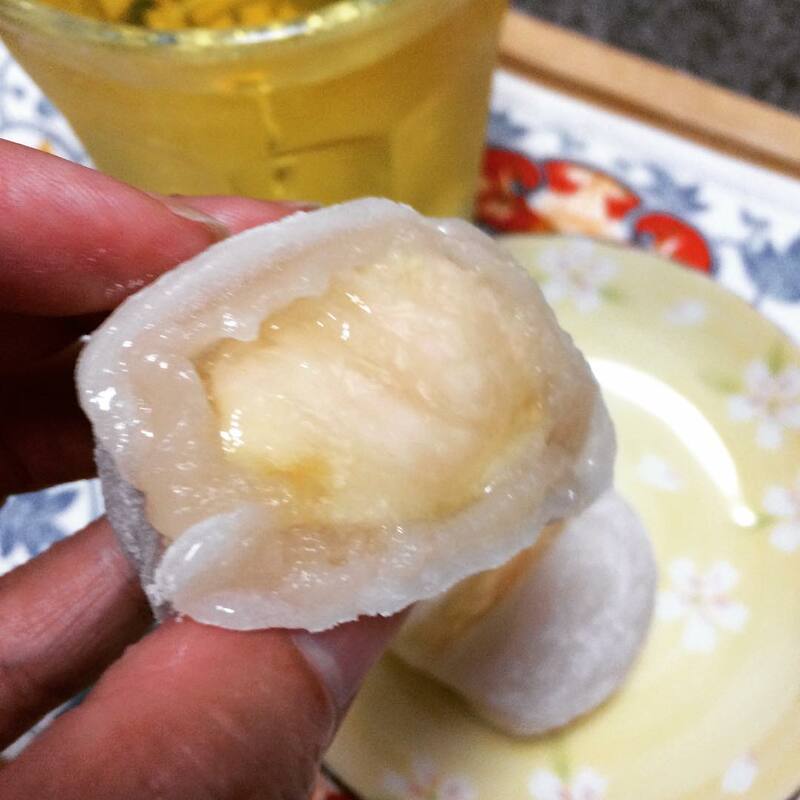 It was my first time purchasing this particular daifuku. I liked it, the piece of peach was a nice size and the daifuku went perfectly with the green tea based fruit tea that I cold brewed. It's the end of July and it's Friday, I hope you have a nice weekend! 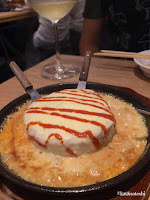 While sitting in Tsutaya recently, I overheard an elderly couple talking about kaimi sauce. The woman was saying that the kanji (Chinese characters) for the "kai" was "ayashii" which means "strange or mysterious" and the other kanji "mi" means "taste or flavor"
Since their convo piqued my interest, I used my smartphone to look up what they were talking about. Mix everything well and store in an air-tight container for up to a week. 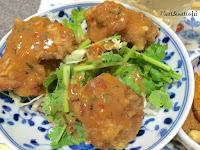 NOTES: Super easy to put together and goes well with karaage (fried chicken). And with the addition of the fish sauce, the kaimi sauce really matched with cilantro too. I think you could use it as a dip for veggies too. 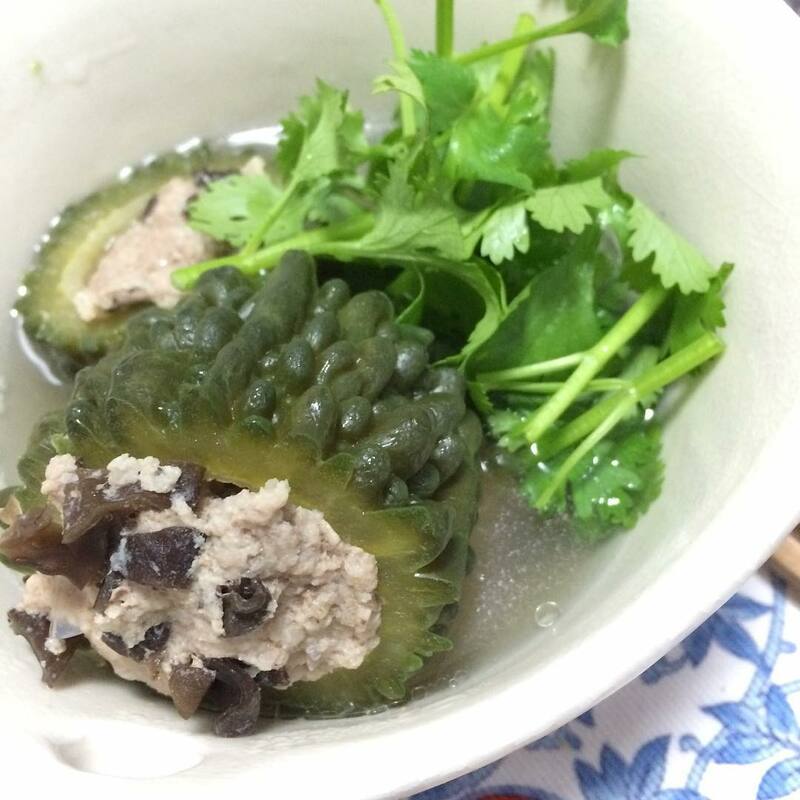 Blog friend, Passthepocky introduced me to a bittermelon soup called Canh Khổ Qua. 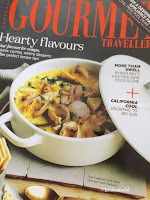 She said her father makes this soup and gave me a link to a recipe that is similar to what he does. 1 bittermelon, cut into 2-inch rings, cleaned. Chop up the reconstituted woodear mushroom and noodles and mix them with the pork. Use the backside of a fork or spoon to clean out the insides of the bittermelon, then stuff each piece with some pork mixture. Bring to a boil then down to a simmer, skimming off any scum that rises to the top. NOTES: No need to pack in the pork mixture as it will expand when cooked. Keeping the cover off while cooking keeps the broth clear. The bittermelon I had was a bit "skinny" so it was kind of hard to stuff. The soup was super bitter because I didn't parboil the bittermelon before stuffing it. The weather was super hot and not really soup weather but I'm glad I got to try this. If I can find bittermelon in the Fall, I want to try to make this again. I got to have lunch with Hiromi yesterday at Guli-Guli. The name is the shortened version of "green green" which when said in Japanese "gu-li-n gu-li-n" turns out to "guli-guli". Anyway they are mostly gardening company but on their property have a cafe and art gallery. When you walk through their front gate it is like stepping into a different country. 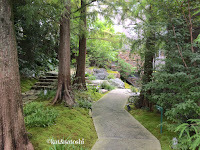 Lush trees, a little brook. Too bad the weather wasn't a bit cooler. In fact, it was blazing hot and sticky humid...gah! 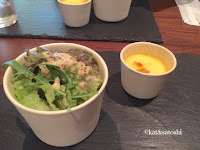 We started lunch with a salad and cold pumpkin potage. 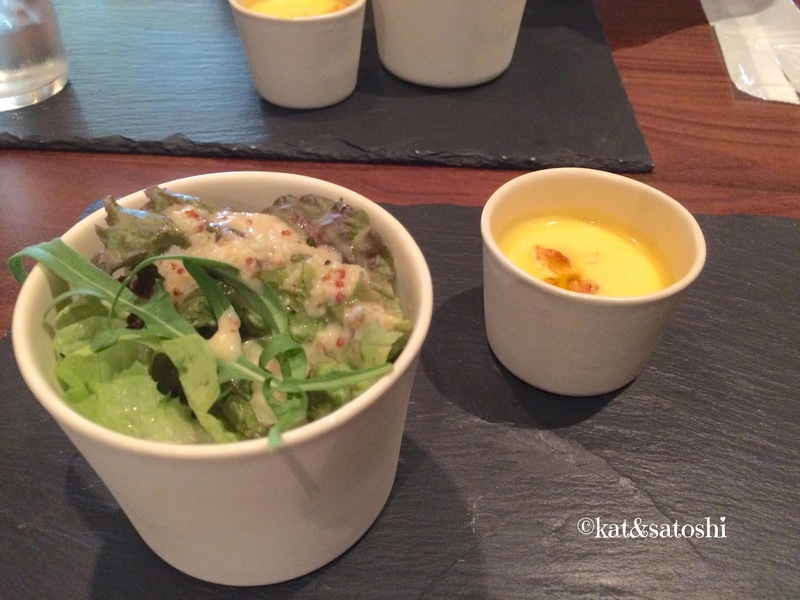 The salad had their homemade mustard dressing and the soup was creamy yet refreshing. From the left, a fried gnocchi which seemed more like a fritter filled with bits of squid and topped with their homemade tomato sauce. Chickpea mousse topped with smoked salmon, too bad there weren't crackers or bread with this, so good! Homemade sesame cracker topped with zucchini, peppers and a smoosh of cream cheese and a dab of shiso pesto. Our main dish was their keema curry. 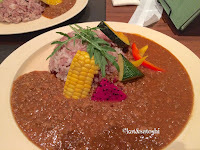 Nice kick from the spices, I was impressed with the sweet dragon fruit that they used as a topping for the curry as well as the colorful veggies. A great place to "get away", they also do weddings and parties. 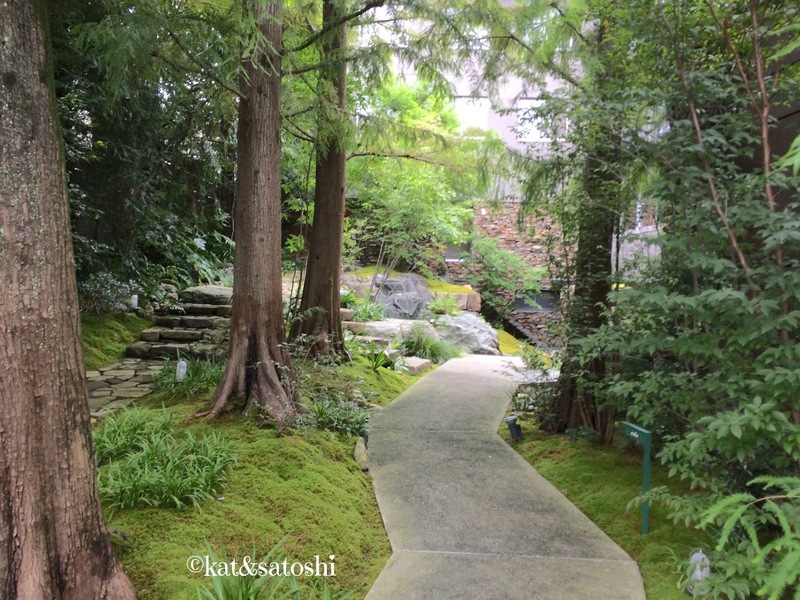 I told Satoshi about this place and he's interested in checking it out. 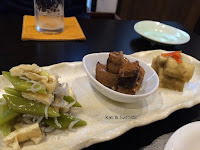 Saturday night, we checked out Wagokoro which is next door to Cafe Yooi. If I'm not mistaken, Wagokoro used to be closer to Ishibashi station, but moved to this area in the last couple of years. I remember eating there with Satoshi (pre-blog). This restaurant specializes in dishes using ingredients from Hokkaido. I was sort of leery about eating here because every time I passed by, no one was ever eating there, ever. We started with some "toba". 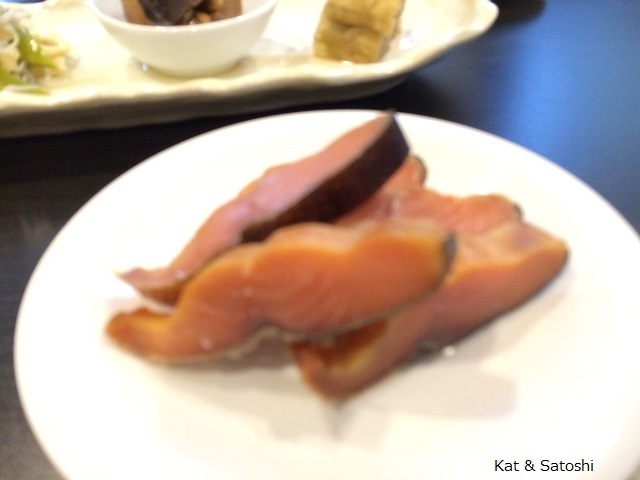 Salmon is dried in strips until hard like jerky. The owner/chef makes her version softer. Next came a plate of some side dishes--these were kind of bland. The fish that was in the middle of the plate was a bit "too fishy" for my liking. 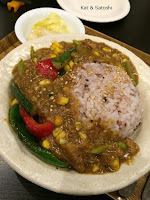 We also tried the curry with summer veggies. This was good, nice kick and lots of grilled summer veggies like okra, corn, zucchini. A bit pricey, small on portions and a very tiny menu, we don't know that we'll be back. We're glad we got to try this place out though. Today is Doyo no Ushi no hi, the day when we all eat unagi (eel) for stamina to withstand the heat of summer. I've written about this in the past here. 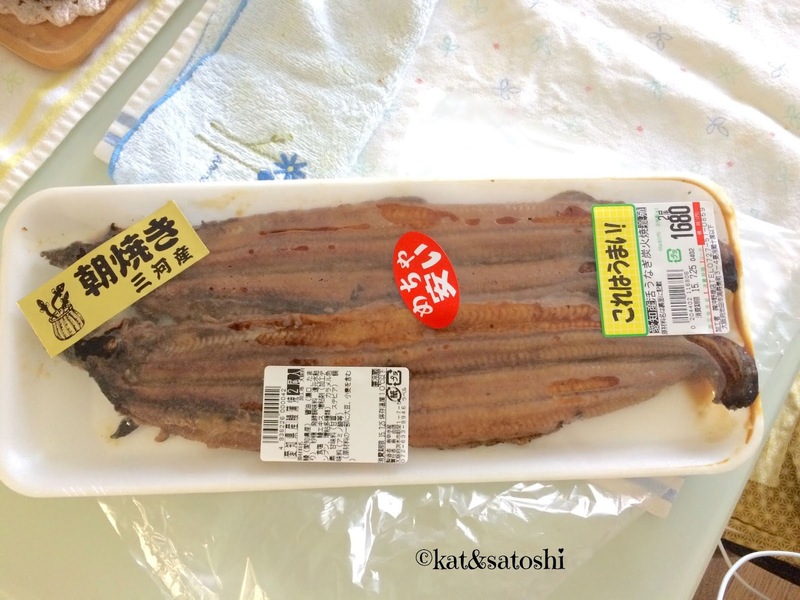 The price of unagi, especially on this day, tends to be quite pricey. So, I was happy to find 2 good-sized unagi for 1680 yen (plus tax). Just before dinner, I'm going to make my own kabayaki sauce using this recipe. If you can't find unagi where you live or don't like it, you could also follow the recipe above to make an eggplant version. I hope it is cooler where you are, we're melting over here! 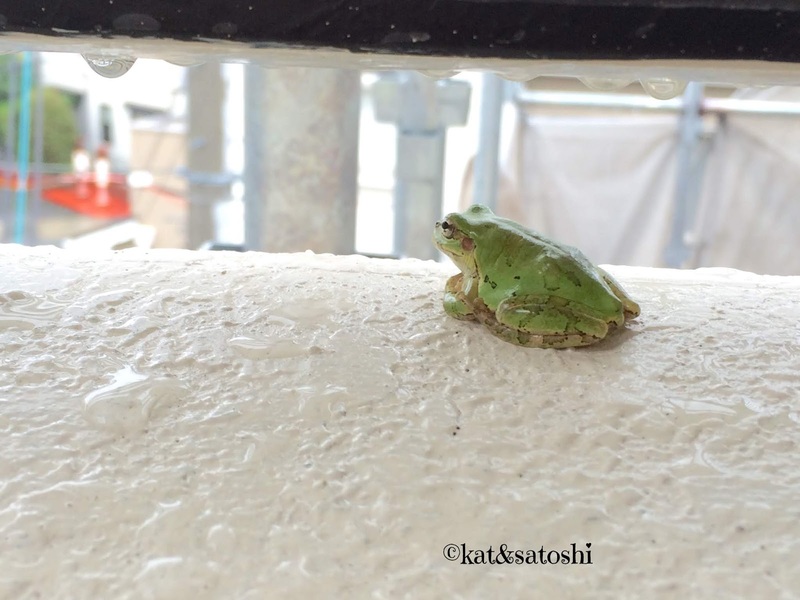 As Satoshi was leaving for work this morning, we noticed this guy on our wall right outside of our front door. 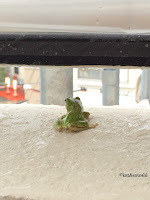 What amazed us is that we live a couple of stories up, so we wondered how he got up so high? 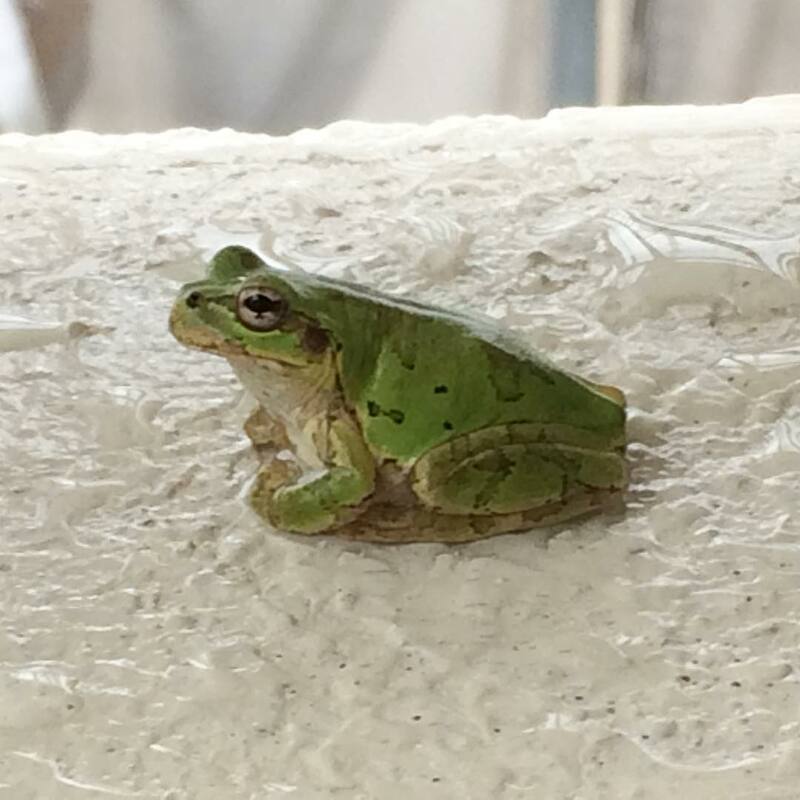 If I'm not mistaken this type of frog is what the Japanese call an "amagaeru" literally "rain frog" (hyla japonica is the scientific name). When I left for the market he was staring out at the rain, possibly wondering when it would stop. And when I came back from the market, he was still there. Oh, frogs in Japan say "kero kero"...what do frogs in your country say? Phil is in town for a quick visit and it was nice of him to take some time out of his busy schedule to contact me to meet up. 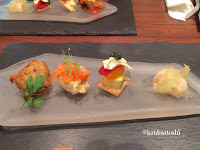 We had drinks and some pupus (appetizers) at Kohaku. This bar is a French-Japanese fusion type of place. 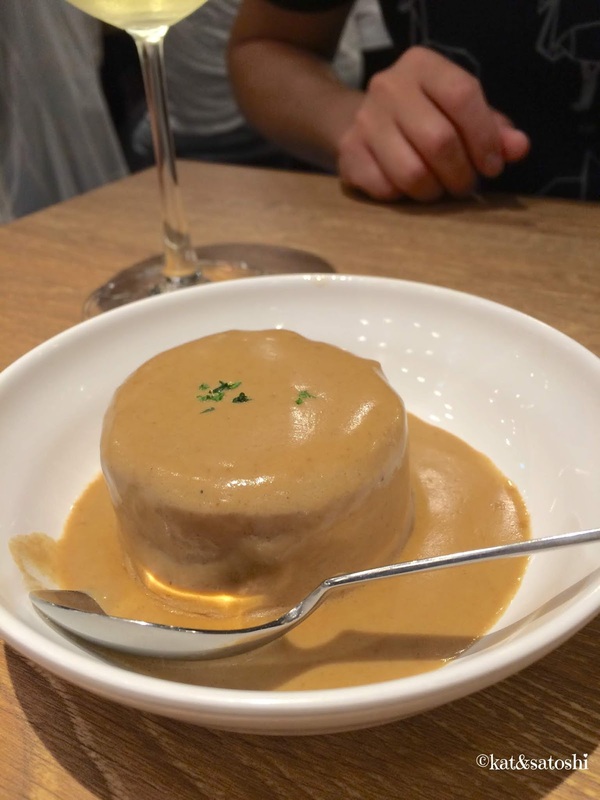 We shared this daikon covered with a porcini cream sauce. The daikon is cooked until tender then smothered in a rich porcini cream sauce. We also shared this "okonomiyaki". Lots of cabbage and some beef is smothered in a fondue cheese sauce and topped with a red wine tomato sauce. Our ears blasted from the noise of the bar, we then headed up to quiet Tsutaya to hang out and chat. The day was nasty humid and I probably won't be back to that bar, but the company and conversation was nice as always. Thanks for meeting up Phil it was nice catching up with you! There is a character by San-X called Rilakkuma. If I'm not mistaken his name comes by combining "relax" with "kuma" (bear). From July 18 until August 31, Rilakkuma has teamed up with Hankyu trains and has trains running on the Hankyu lines to Kyoto, Kobe and Takarazuka. The times that the trains are running are not advertised, so you need to be in the right place at the right time, I guess. We were lucky to come across the one running to Takarazuka and jumped on board. 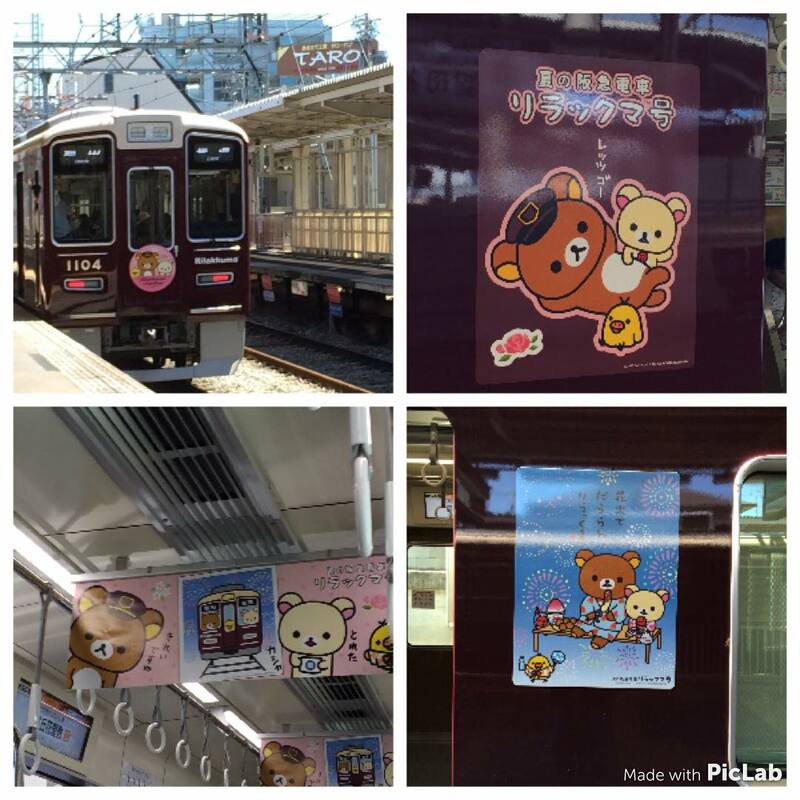 The advertisements inside the train car are all illustrations of Rilakkuma. 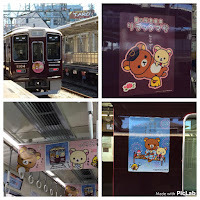 The sign at the very front and back of the train are illustrated with Rilakkuma as well. 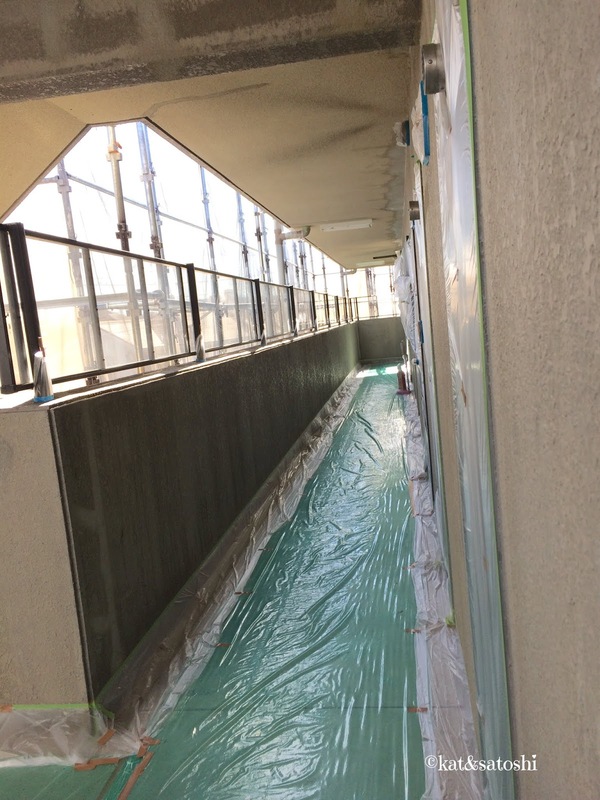 Takarazuka's color is pink, Kyoto is green and Kobe is blue. Only in Japan are they able to make trains look so kawaii (cute)! Today is Umi no Hi (literally Ocean Day). I've written about this holiday before here. 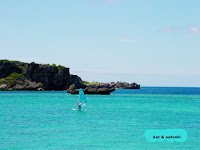 This photo was taken back in 2003 (pre-blog) on a trip to Okinawa. I think this was near Manzamo. On this particular trip we met up with my long-lost relatives which I wrote a little about here. We're literally melting over here but I hope you have a great week! The typhoon is taking its sweet time passing over us. Yesterday, the winds were high but overall just cloudy with some off and on showers. The building face-lift people came to take down their net-like "curtain" around their scaffolding, I think this is to prevent the winds from blowing everything down. Today, it looks like we're gonna have rain all day. If you look at a map of Japan, the eye is around Okayama, and the circumference of the typhoon stretches to the left-side of Honshu all the way to the middle of Kyushu and stretches to the right-side of Honshu touching East Japan....HUGE! The weather guy said that typhoons spin in a counter-clockwise pattern, so anything to the right-side of the typhoon usually gets the heavy rain and winds...interesting, yeah?! Tomorrow is forecast for more rain as the typhoon is still making its way to "wherever"...Hopefully we'll be able to ride this out without any excitement. 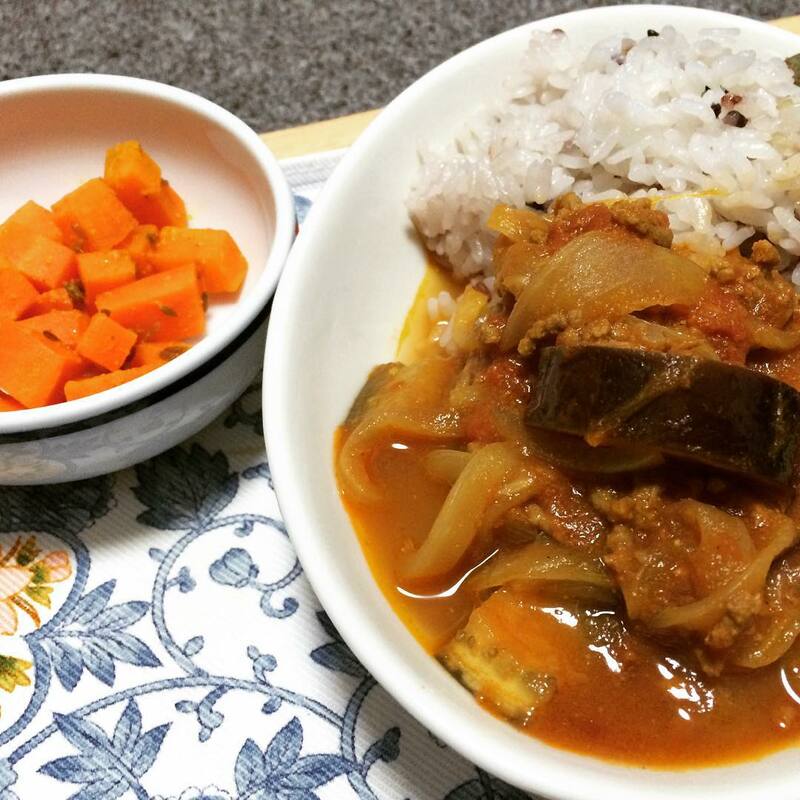 I recently tried two recipes from Jinsuke Mizuno's "Hajimete no Spice Curry #2". The "black" eggplant curry didn't turn out like the photo in the book because I made a couple of mistakes along the way. The carrot achaar on the other hand was super easy to put together. 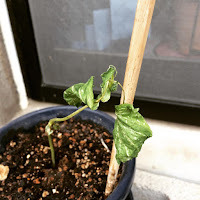 NOTES: I didn't read carefully and didn't fry the eggplant so when it came time to add the eggplant they weren't even cooked, so I needed to cook everything longer than the 5 minutes. As I was getting things together for this recipe, I ran out of cayenne pepper, so I only put the amount I had. I also didn't have ground black sesame seed, so I added ground white sesame seed instead. The market I had bought the eggplants from, sold me duds, most were black-ish when I cut them open. I think they were partially frozen...boo! Anyway, not wanting to run out to the store, I salvaged what I could and made the curry with what was left. NOTES: not wanting to boil the carrots, I just added the raw carrots to the heated oil and cumin seed. I used ground white sesame seed because I didn't have black. I only had a little nub of lemon in my fridge, so I just used what I had. I love the heat from this and the lemon gives it a little brightness. 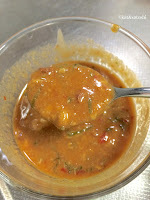 Even though I had some problems with the curry, I enjoyed the flavors of both dishes. I'm making both again. 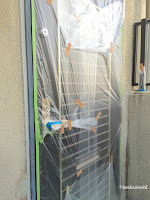 After some krazy days of rain and days of caulking...it looks like they'll finally start to paint. 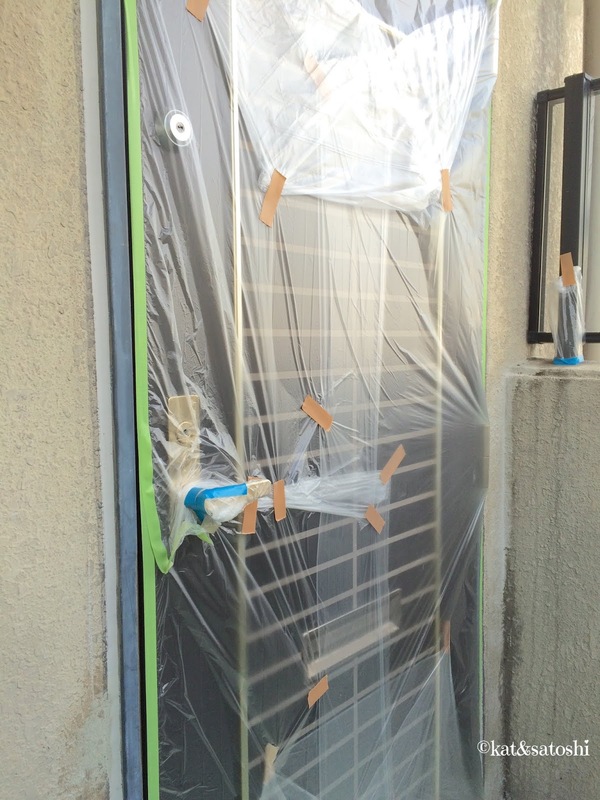 The other day I heard them taping and some plastic rustling. The next day when I went out, this is what I saw...whoa?! The door pocket and peephole couldn't be used. I'm glad they made slits in the plastic for our keys. I hope they finish up soon, my plants need fresh air and sun! Oh and there is a typhoon approaching which is supposed to go right over us...gonna be krazy weather over the next couple of days. I'm stocking up on some food and snacks and hoping that we don't get much damage...talk to you soon! 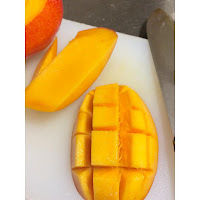 Have been seeing mango in the markets. Some are imported from Mexico and are reasonably priced. On the other hand, the krazy priced ones are "local"...from Miyazaki (Kyushu) or Okinawa. The highest priced one I've seen was 8000 yen...for one! 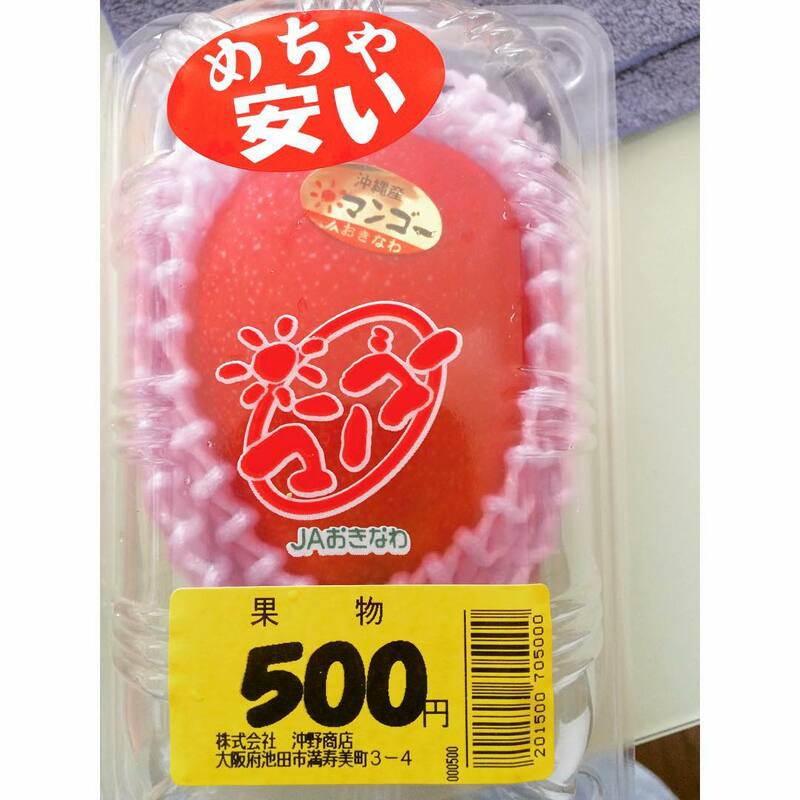 At the fruit and veggie stand that I often shop at, they had one for 500 yen! I thought this was a bargain, so I bought one for us to try. It weighed 300 grams or so (a little over half a pound). The mango comes with "instructions" on how to cut and eat it. 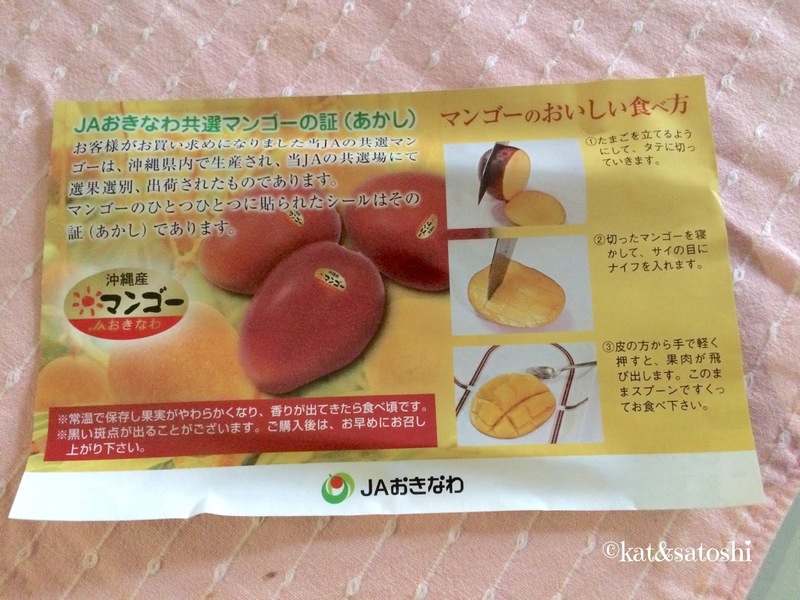 The flyer in the container and sticker on the mango is also the mango's "proof" that it was grown in Okinawa. 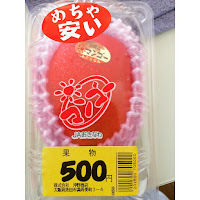 The flyer also refers to the mango as a "tamago" which means "egg" which I thought was kind of strange. This mango was really ripe. I tried cutting a piece like the way they said to on their instructions, but found it to be a p.i.t.a. and ended up peeling the mango instead, way easier! This mango seemed really sinewy (stringy) to me. I can't tell you what variety it was, but I think the ones I've eaten in Hawaii were a bit firmer with less "strings". Anyway, this was deliciously sweet and I'm glad we got to try this. What fruits have you been enjoying this summer? It had been awhile since I had been back to Patisserie Y Style. 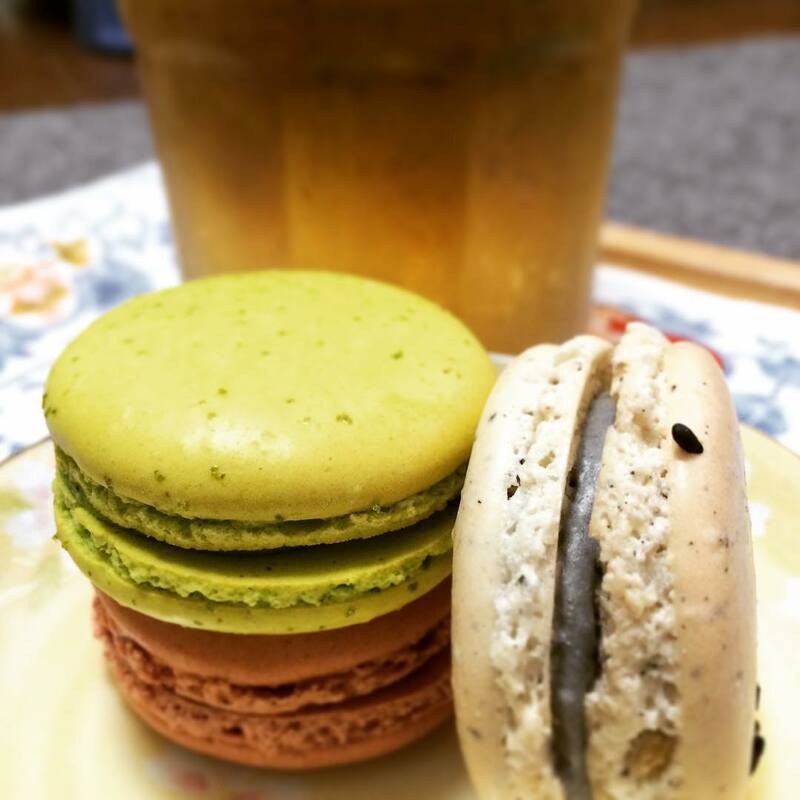 This time around I tried a few of their macarons. I tried the matcha (green tea), sésame (black sesame) and châitagne(japanese chestnut). 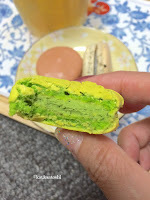 The matcha which was a fluorescent green threw me off a bit as usually this color is used with pistache (pistachio) macaron. But I liked the texture of this. 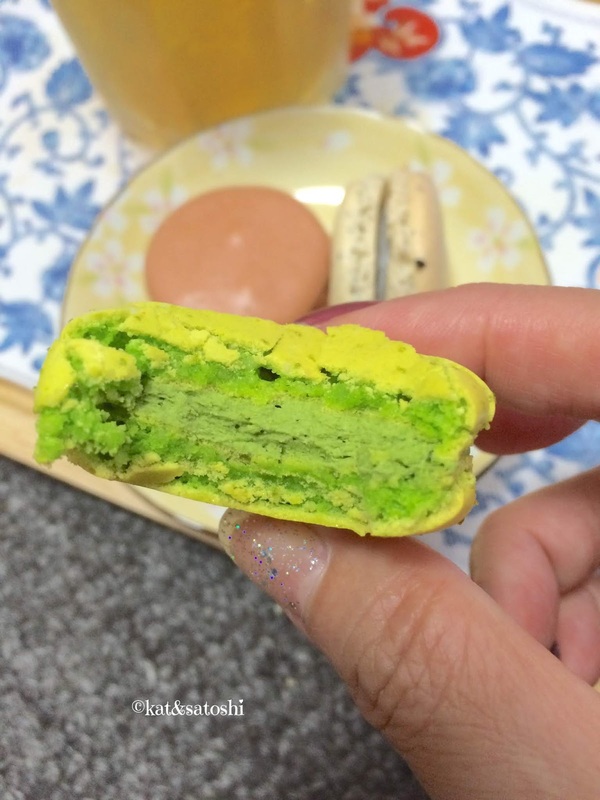 The fillings for these macarons are flavored buttercreams. My least favorite was the châitagne(japanese chestnut), there was no "chew" to the macaron, it kind of just crumbled when I bit into it. 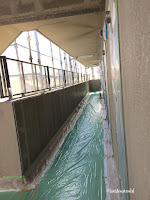 Previously, they had no cafe space, but on this visit, I noticed they have a few tables out in front of their shop now and are also selling kakigori (shaved ice). With this krazy humidity and heat, I may have to go back soon. Do you like takoyaki? Me, I don't really care for them, the insides tend to be a little too "raw" for my liking. This past Saturday, while catching up with Tamakikat, I got to try Le Garage's tako-nuts. The naming of this dish is quite funny to say! 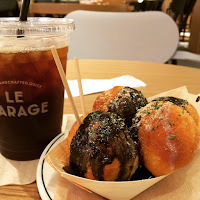 They are actually doughnuts that are made to look like takoyaki. They had 4 different glazes to choose from, but I debated between chocolate or black sesame for realism and went with black sesame. The sesame sauce is a little runny and black like squid ink, so be prepared to get some all around your mouth when you bite into the doughnuts. These doughnuts are fried to order so they come out piping hot...delicious! Thanks for meeting up Tamakikat! The weather has been pretty nasty. Humidity paired with drizzles. 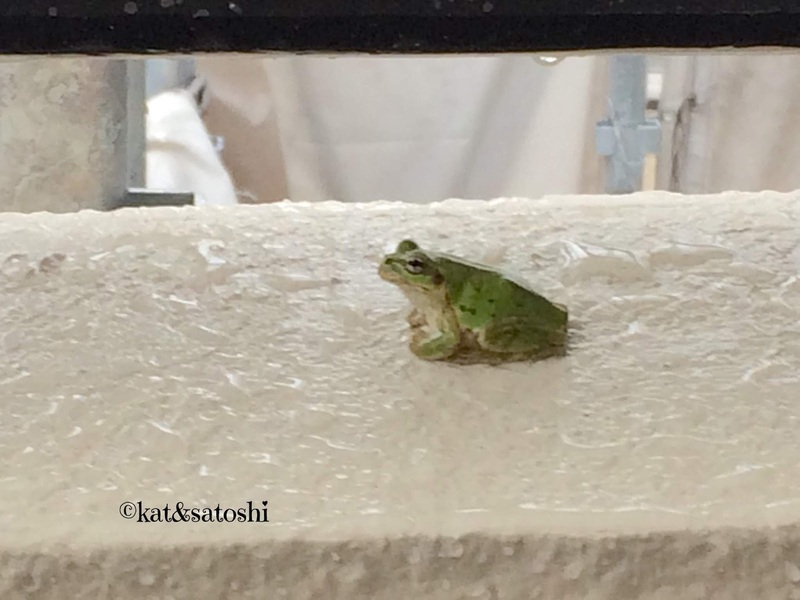 I guess we should be thankful that we haven't had massive downpours like Kyushu, but still, I hope rainy season will end soon. Since it's been dreary, and grossly humid, all mojo to "cook" has almost been depleted, so I've been making salads for our dinners. We also usually have edamame and another dish like hiyayakko (cold tofu) usually topped with okra. I'm gonna side track a bit and tell you about the other day at the market. After listening to her pitch, we got a package of their original gyoza, 20 for 1000 yen (plus tax). When we got home, I repacked them into 5 pieces each and froze them. Then last night, I cooked some of the gyoza. 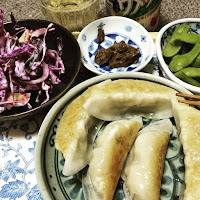 I had seen on a tv show that instead of cooking the gyoza in oil first to brown the bottoms, you put a little water in the frying pan and "boil" and "steam" them for a bit then when the water evaporates, you add a little oil to brown the bottoms. The result is the "skins" of the gyoza become chewy and the bottoms, very crisp. I'm gonna cook gyoza this way from now on. Back to the dressing...super easy to put together and I like that this doesn't use mayo. NOTES: this dressing isn't overly sweet. I used the dressing with some thinly sliced purple cabbage, purple onion and purple carrot. The author also notes that this dressing could be used for a fruit salad. I'm making this again. Yesterday, after the dentist, I picked up a couple of canelé from Daniel. Matcha, Fig & Walnut, Blueberry Coconut. These are cute (about 2 inches high), perfect for gifts or a snack. I'm glad I tried these, I'll be back. Trending these days are jar salads. 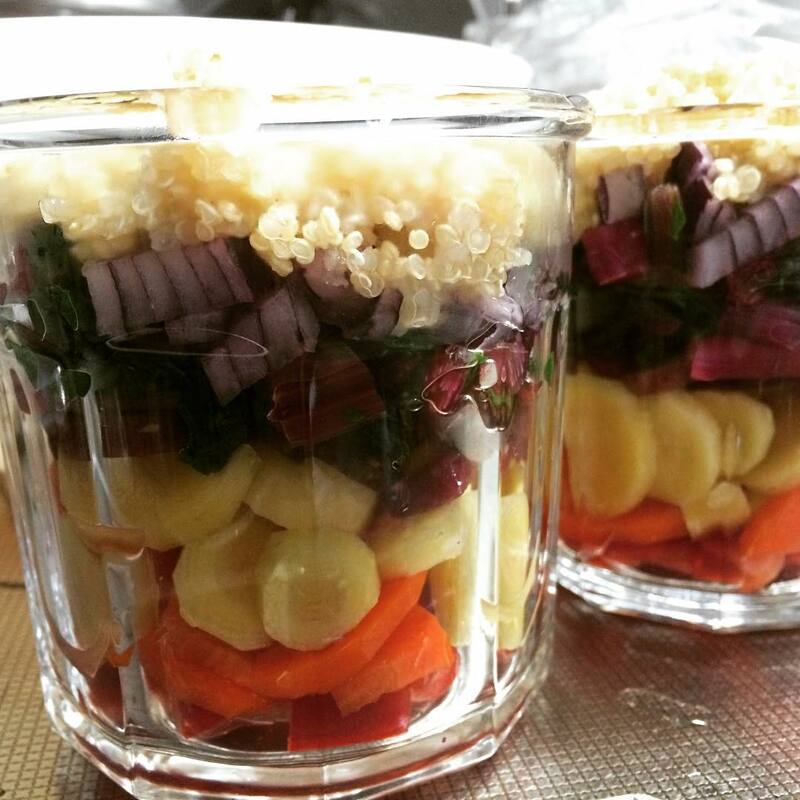 You layer your favorite veggies, dressing and other goodies in a jar. 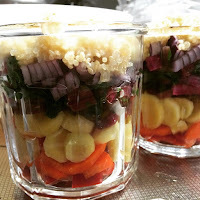 Put the dressing and heavier veggies at the bottom and the lighter ones on top. Then before eating, give it a shake and then eat it straight from the jar or turn it out into a bowl. The "trendy way" is to put your salad into a mason jar. Me, I put my salad into a 14 oz (400 ml) Luminarc Jar with a plastic cover. 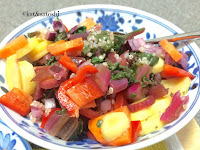 My layers: red bell pepper, orange carrot, yellow carrot, purple carrot, wilted swiss chard, diced red onion and quinoa. A word of caution...I've heard that since people make a lot in advance (like for a weeks worth of lunches), there are also problems with the salads spoiling and/or getting contaminated with bacteria, so just keep in mind the kinds of things you put into your jar for the salad and how far in advance you do this. Also, with the summer heat, you might also want to put your jar salad into an insulated bag or keep it in the refrigerator until you are ready for lunch. For this salad, I put it together after lunch, so it would be chilled by dinner time. When dinner time came around, I turned my salad out into a bowl, it was easier to eat that way. The combinations are endless and I hope you enjoy this. It's really a fun way to eat the rainbow. I've had LeBresso on my "to try" list for some time now, the thing about this place is that they are only a coffee/tea and toast type of place, more of a "morning place" in my books, not a place where you could get a sandwich or something else for lunch. So on Saturday, while I waited for Satoshi to finish his German class, I went to check them out for a late breakfast. The place is small, only 7 seats along a counter. When I got there, all the seats were taken and another customer was waiting in line for a seat as well. After sitting and waiting for a bit, a group of 4 came and wanted to take out some toasts...they were told that they needed to wait until AFTER me and the other guy got our order in, then they could order take out?! WT?! Then a couple of seats opened up. 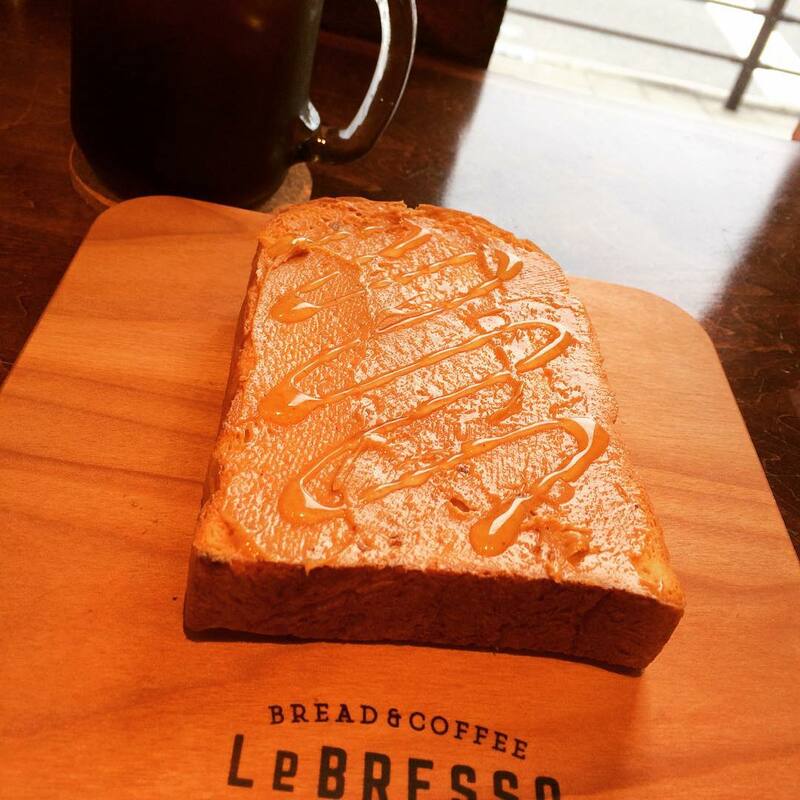 Their bread doesn't use eggs, I think this is the type of bread that is trending these days, instead of eggs, they use heavy cream. Not toasted the bread is super soft. When toasted, the texture of the bread is fluffy on the inside and the crust crisps up. Overall, the flow of service here seemed a bit off. I'm glad I tried this place but I probably won't be back. 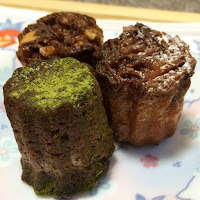 Quolofune (pronounced ku-ro-fu-ne) is a sweets maker specializing in Western type of sweets. Kurofune literally "black ship" is what the Japanese refer to when talking about the foreigners that came to Japan during the days of the samurai. 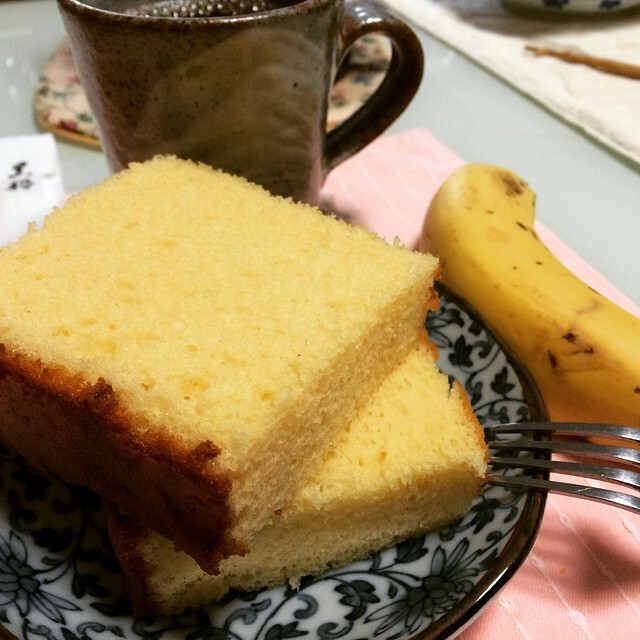 This was lighter than most other castella we've tried, leaning more towards a chiffon cake. I'm glad we got to try this, it was perfect for breakfast. 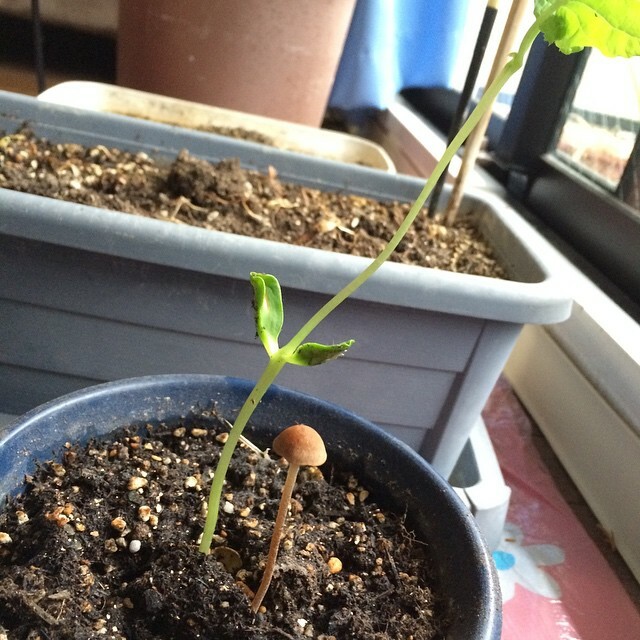 In a week, the goya got taller, I also notice a mushroom growing too. I had to bring EVERYTHING indoors because they are not only painting, but re-doing the packing around the door jams and stuff like that. I think it was a couple of weeks ago that my friend Rona, sent me a message saying that she was sending me some chocolate. 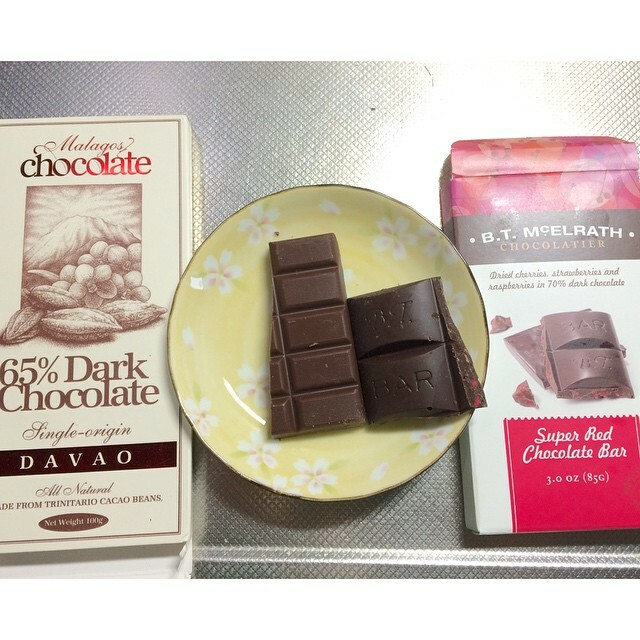 The bar on the left is by Malagos Chocolate. A chocolate maker in the Philippines. Their 65% cacao single origin bean to bar was creamy with hints of fruits and is made from Trinitario Cacao beans. The bar on the right is by B.T. McElrath. I've tried their salty dog bites before (love!). This particular bar is 70% cacao and filled with dried fruits like strawberry, raspberry and cherry. There was a LOT of dried fruit in there! I really liked both bars and am glad I got to try both. Thanks Rona! I appreciate your kindness.